During the winter of 1950-51 spent at St Bonnet, Vivian Maier stopped at the place du Peissier; a name formerly given to fishponds intended for trout breeding. 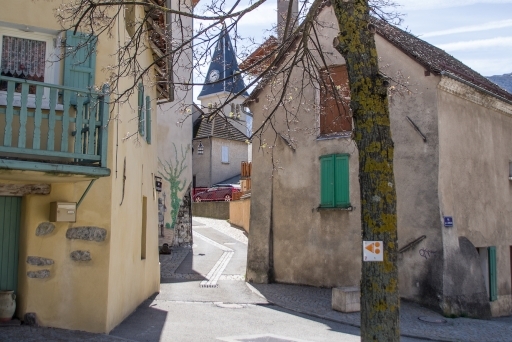 From here, since medieval times, the rue des Ecuries leads into the village. This is the birthplace of the constable of Lesdiguières who was the leader of the Protestants of Dauphiné and companion in arms of the future king of France, Henri IV. In her early work the artist used a Kodak or a Leica camera producing 24x36 rectangular format prints. Vivian positioned herself exactly in front of the alley to take her photo partially against the light. The left side under exposed draws the viewer back to the centre of the image and the eye is forced to enter between the buildings, where she captured the patch of snow bathed in sunlight. Then the eye rises up to the white rooves until it reaches the church bell tower.